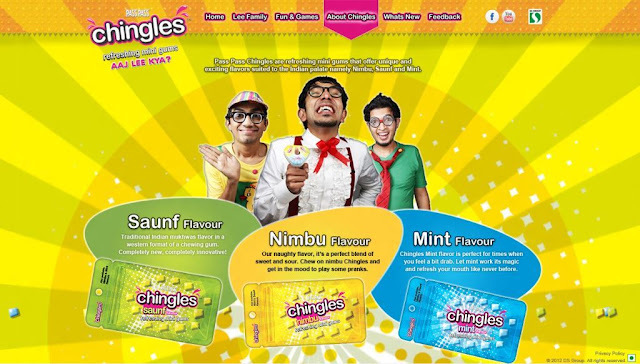 DS Group has forayed into the confectionary segment with Pass Pass Chingles chewing gum, an extension of the mouth freshener mother brand 'Pass Pass'. The communication plank that they have taken is irreverent fun, the tagline being ‘aaj lee kya’. You may have seen the not-so-funny TV commercial. What’s interesting is that the brand is going all out on digital which might actually be a first for the group. The website creative sticks to and builds on the campaign theme which is great as we do know how many brands create silos on the web that don’t speak the overall campaign language. Site visitors are introduced to the ‘Lee family’ members that we see in the TV commercial and it has some branded wallpapers for download. They are still to go live with a few elements on the site, so content wise it’s still basic. But I like the overall execution. In addition to the website, they have also started out with a Facebook Brand Page and a Youtube Brand Channel which are currently in their nascent stages. We will surely keep a look-out for new updates on this one.